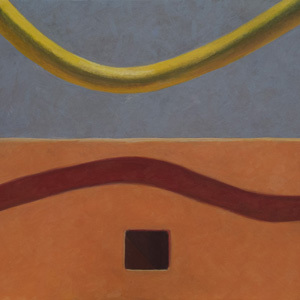 Rose Wave, 2013; oil on canvas, 20 x 24 in. By the time I get to Phoenix, 2015; acrylic on canvas, 30 x 30 in. 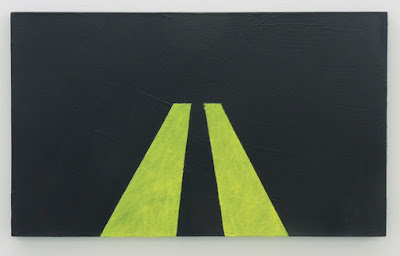 ....or of perspectival rectangular shapes, disappearing like road markings into the distance, and titled after a popular song? Heilmann uses the language of formalist painting to deny the formal: to evoke memories, allude to stories, to activate the sensuous. In her recent show, Geometrics: Waves, Roads, etc. , at 303 Gallery, there was so much pleasure in paint, and in the images and objects that color transforms. 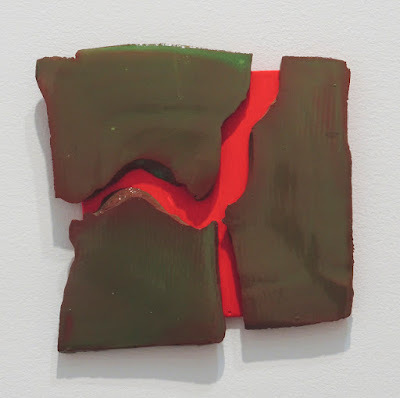 The overlapping square format of the painting above is one that Heilmann uses often. 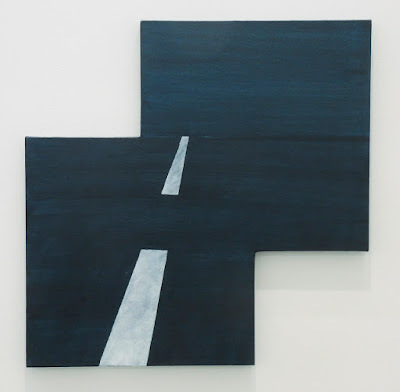 It has a way of confusing space, which seems to be clear––the white line stops at a horizon––but the entire surface is flat, so it confounds the illusion. 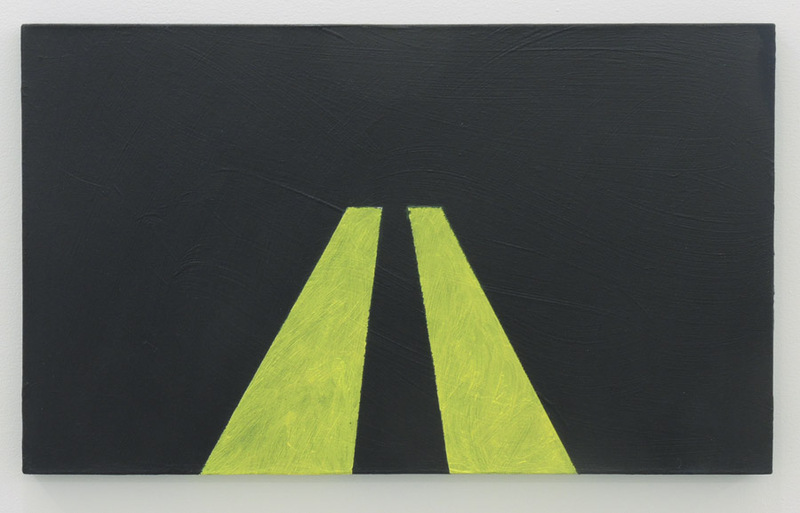 Highway, My Way, 2015; oil on canvas, 18 x 30 1/8 in. This is a geometric painting, but it's also a poem, an ode to night travel, to headlights in the dark. In the catalog for Heilmann's solo museum exhibition To Be Someone, which I saw at the New Museum in 2008, there is a description of the slide show she gives, called Her Life. 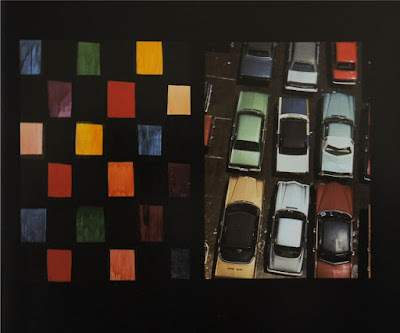 In it she juxtaposes two images, sometimes her work and a photo, as above, sometimes two photos, which can be of traffic, of architecture, of neon signs. They can allude to childhood memories, a childhood she spent in California. 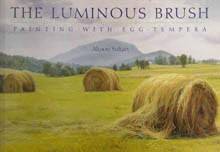 She gives clues about the paintings, though the paintings aren't simply illustrations. Green Room, Turquoise Lights, 2015; acrylic on canvas, 18 x 24 in. 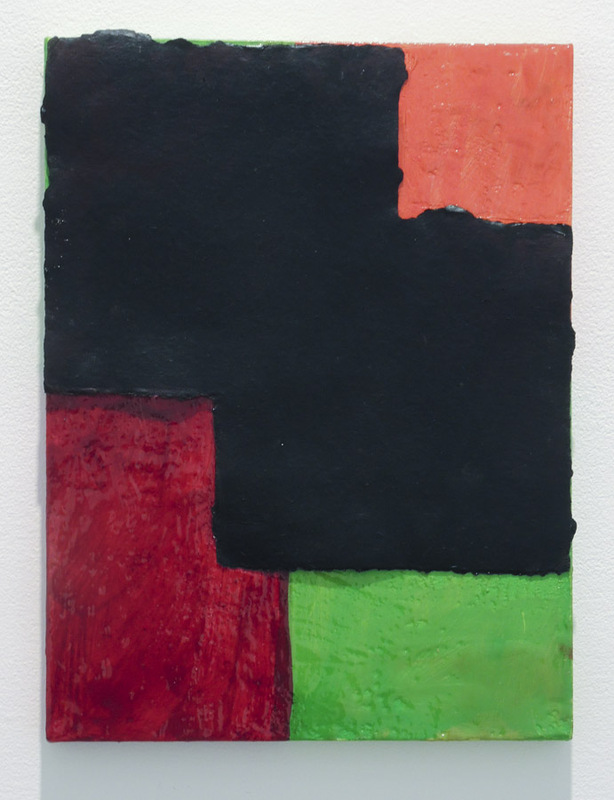 Heilmann's paint is always luscious, with fresh strokes that play with the geometry, never taking it too seriously. 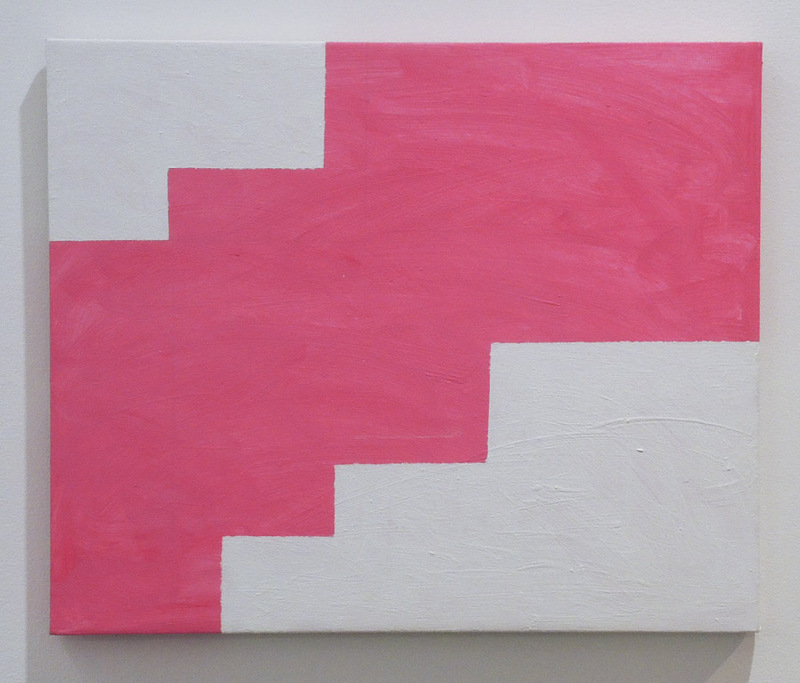 Geometric Right and Geometric Left, 2015; acrylic on canvas 30 x 30 in. These two paintings, like By the time I get to Phoenix above, are shaped canvases; they are flat. 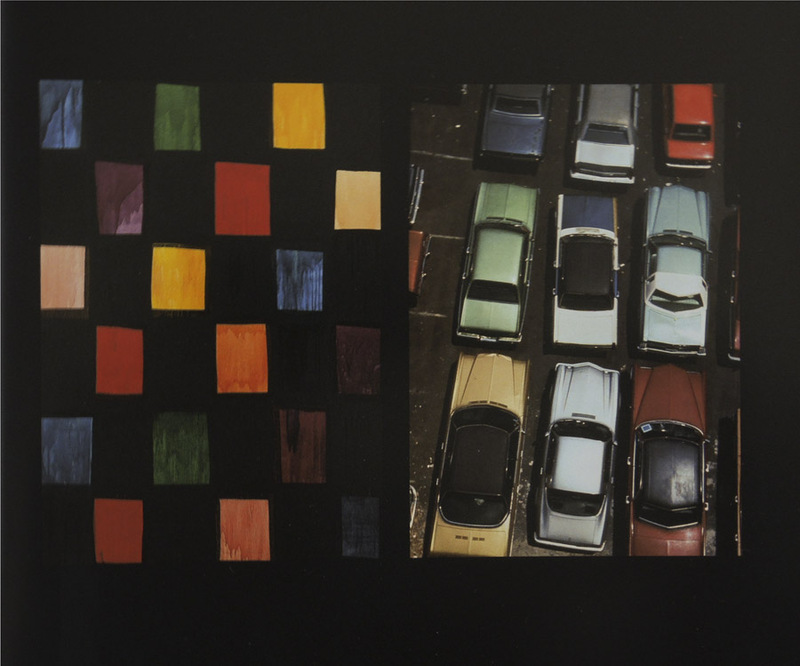 Like the three shaped paintings in the photo below, they play with color and shape and illusion. The shapes are crisp, the paint fluid. 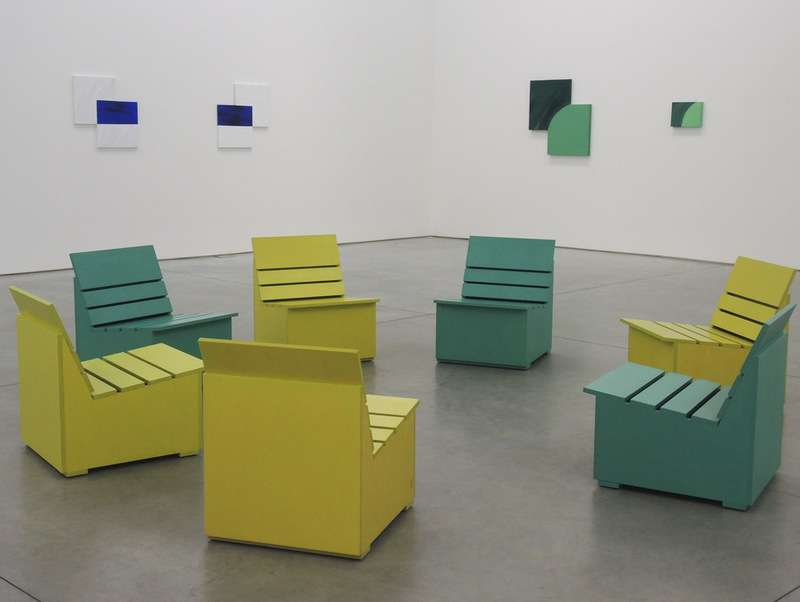 Sunny Chaises, installation; painted plywood, each 25 1/2 x 20 1/8 x 24 1/4 in. Heilmann ventures into the actuality of the everyday, by designing simple chairs that are brilliantly painted abstract sculpture, and an invitation to sit and enjoy being at this show; they tell us that we should linger. A grouping of similar chairs enlivened one of the terrace spaces at the new Whitney Museum of American art. Family Tree, 2015; acrylic on paper, 6 1/8 x 6 in. Paint moves across irregular surfaces, in irregular squares, with three primary colors playing with two secondary ones. I love seeing the different grounds and mediums that Heilmann uses––canvas and paper and wood and ceramics––and her inventiveness with all of them. 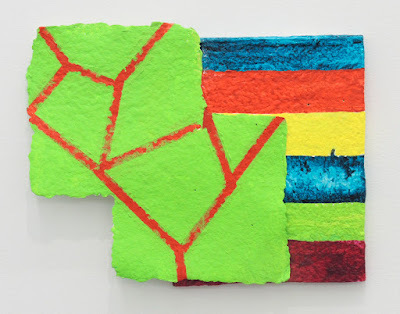 First Date, 2015; oil on handmade paper (Ruth Lingen and Akemi Martin), 12 1/2 x 15 5/8 in. The energy of a first date is sizzling in this work on paper, with two characters, each very different, interacting; one certainly takes over. Even with these disparate elements, a whole is surprisingly created. 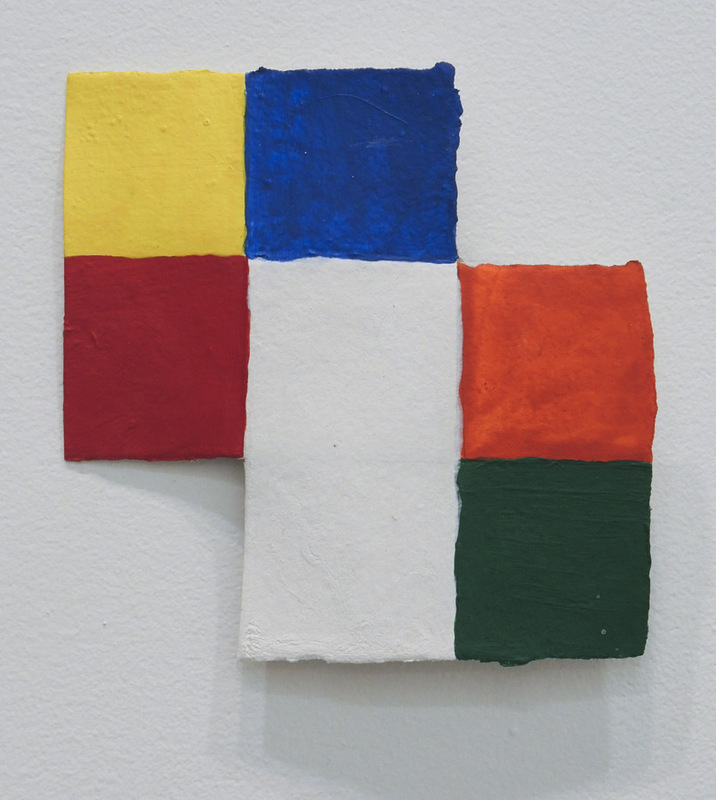 Two Logics, 2013; oil on canvas with handmade paper and epoxy, 15 3/4 x 11 3/4 in. Two Logics has more play with offbeat rectangles and different materials. Another aspect of Heilmann's work that I admire is the modest sizes of her works; all are physically appealing, with a sense of the hand and of the body; none are overpowering, all invite personal attention. San Andreas, 2012; glazed ceramic on painted wood, 8 3/4 x 9 in. A sizzling molten core shows beneath the green earth of glazed clay. 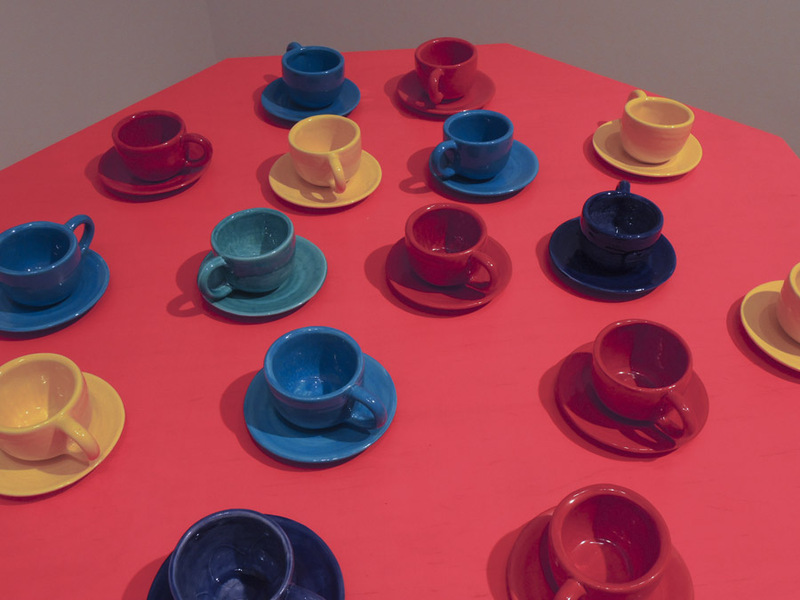 Cups on a Table, detail, 2009-2015; painted wood, glazed ceramic, 28 1/2 x 48 x 48 in. 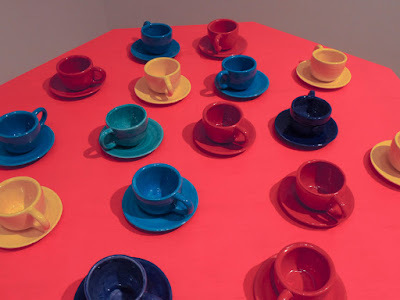 Clay, in the form of thick, brightly painted teacups covers a low red table (see the entire piece here). 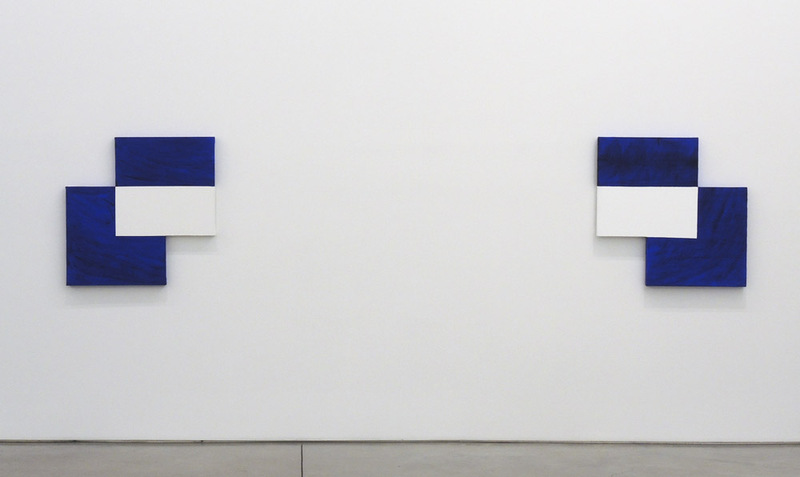 As with her chairs, Heilmann makes art out of the very ordinary. Her open geometries were a joyous tea party, roads to adventure, waves of color, painterly rectangles. 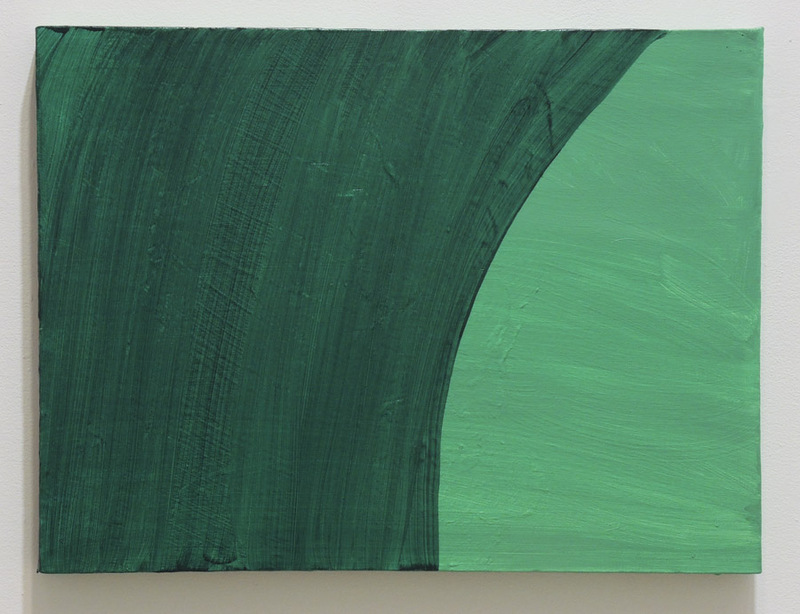 Heilmann's work is a serious delight. I confess it's almost like having the punch-line of a joke explained, seeing the slide of automobiles next to the abstraction...I'd rather not know...but that's just me. Some of these, especially "First Date", remind me of the first word I read: EXIT, as on one visit to the movie-theater, when I was around five years-old, the strange red-and-yellow stained-glass lights above each door explained themselves, the motif was code for "you can get out here!". It is ok to appreciate this stuff, without knowing what-they're-about. I am so glad that you get to see these things, and that you share them. I totally understand your reservations regarding "knowing" what the paintings are about. But, of course, they're not only about the story; if they were, Heilmann would be painting narrative pictures. But she does use titles to evoke memories, so she wants us to think beyond color, form, space, though those are very important. "There has to be a mystery...."
Orange and Almond Cake, "Tarta de Naranja"
A New Textile: "Back and Forth"
A New Painting: "Black Form"
A New Textile: "Bound Circle"